Plan your route | Fjord Marine Shuttles - The Fjord Marine Shuttles offers cruises on the Saguenay to help you discover its majestic fjord. Four ships cruising the 100 kilometers of the Saguenay Fjord for your pleasure, from Chicoutimi to Tadoussac. Visit Tadoussac! Full day round-trip excursion allowing you to visit Tadoussac during a 7 and a half hour stopover! Classic cruise on the mythical Marjolaine cruise ship, the oldest passenger boat still in operation in Canada! After a stopover in Ste-Rose-du-Nord to discover the "Pearl of the Fjord", admire the Notre-Dame-du-Saguenay statue and the highest rock formations in the fjord. Enjoy a day on the water from Ste-Rose-du-Nord! Round-trip excursion to l'Anse-St-Jean, includind a view of the Notre-Dame-du-Saguenay statue, the highest rock formations in the fjord, and a 2 hour stopover in one of the most beautiful villages in the province! Discover l'Anse-St-Jean from the national park! Round-trip excursion to l'Anse-St-Jean including a view of the Notre-Dame-du-Saguenay statue, the highest rock formations in the fjord and a short stopover to see one of the most beautifull villages in the province! Explore the fjord from Tadoussac! 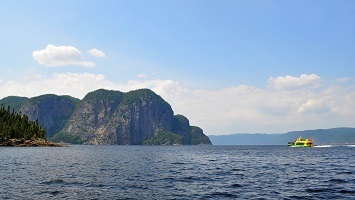 Round-trip cruise with a 1 and a half stopover in l'Anse-St-Jean, including a detour to the Notre-Dame-du-Saguenay statue and the highest rock formations in the fjord on the way back. PERFECT FOR FAMILIES! Classic 3 hour round-trip afternoon cruise on the Marjolaine, with a view of the Notre-Dame-du-Saguenay statue and the highest rock formations in the fjord. Large, familly-friendly boat allowing your little ones to move around! The fastest way to the Notre-Dame-du-Saguenay statue! Quick one hour and a half round-trip afternoon cruise to the statue and the highest rock formations in the fjord. Admire the Notre-Dame-du-Saguenay statue from water level! Round-trip afternoon excursion to l'Anse-St-Jean (no stopover). Explore the fjord to Tadoussac! Round-trip cruise to Tadoussac, including a detour to the Notre-Dame-du-Saguenay statue and the highest rock formations in the fjord on the way. TOP ATTRACTION! Croisière Fjord et Monde! Discover the fjord on land and water! Guided minibus circuit in the morning allowing you to discover the villages of the fjord, 2 hour stopover in l'Anse-St-Jean, and return by boat in the afternoon to admire the fjord, the Notre-Dame-du-Saguenay statue and the highest rock formations. TOP ATTRACTION! Croisière Fjord et Monde! Discover the fjord on land and water! Admire the fjord, the Notre-Dame-du-Saguenay statue and the highest rock formations with a morning boat excursion, take a 2 hour stopover in l'Anse-St-Jean and return with a guided minibus circuit in the afternoon allowing you to discover the villages of the fjord. Visit l'Anse-St-Jean from the Cap Jaseux Park! Round-trip excursion to l'Anse-St-Jean including a view of the Notre-Dame-du-Saguenay statue, the highest rock formations in the fjord and a 2 hour stopover to explore one of the most beautifull villages in the province! Go on an excursion to the Fjord-du-Saguenay national park from the Cap Jaseux Park! With a 4 hour stopover, you8 could even walk right up to the Notre-Dame du Saguenay statue!